♥ Printable Tic Tac Toe Valentines ♥ Instant Download! 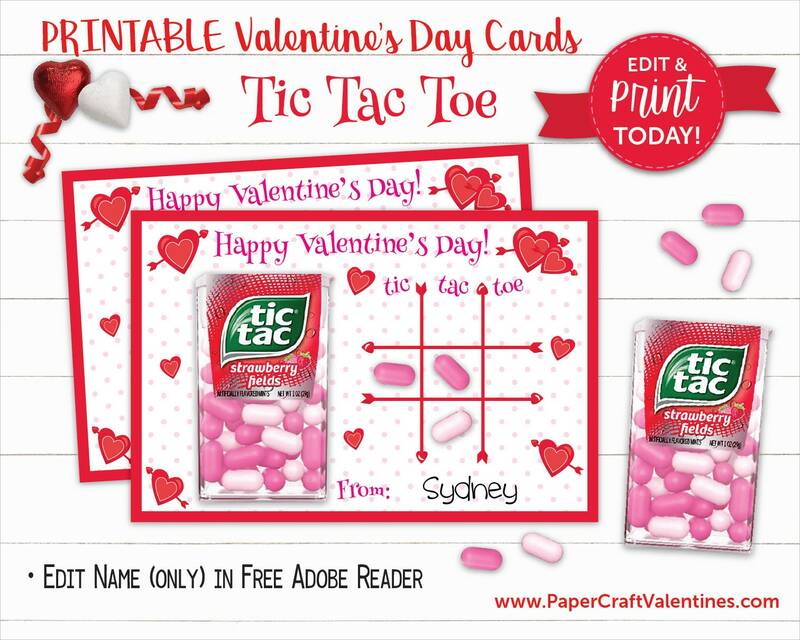 ♥ Attach a box of Strawberry Tic Tacs for a fun Valentine's Day party game! ♥ Print as many as you need! ➤ Full support included with purchase! Detailed directions are included. ➤ Each page is formatted to print on 8.5" x 11" matte finish photo paper or card stock to easily print at home or at your local Staples/OfficeMax, etc. After payment, follow the link to your Etsy Download page (or find it on your Etsy Purchases page) and click on the Download Now button. Save any changes you make. You can ONLY type into existing text fields. You CANNOT edit these on an iPad, iPhone, Chromebook or any handheld device/tablet. Text changes (other than editable fields), color changes and design changes are NOT included in the purchase price of this kit. All items will be personalized as shown in the example images. Please keep in mind that colors on computer monitors and printers may vary. Thank you and Happy Valentines Day! Visit my sister shop https://www.etsy.com/shop/PaperCraftParty for invitations and printable parties! This was perfect for my 2 year old granddaughters valentine. Seller was very quick to respond and address my issue. Within minutes she had me able to print and be on my way. The files can only be downloaded and edited on a desktop or laptop computer. They cannot be downloaded or edited on a cell phone, tablet (iPad) or a Chromebook. Do you edit the name or do I? The name's (child's and teacher's) are editable by you. Open in Adobe Reader, highlight the name and replace. Can I leave the name blank so my child can sign their name? Yes, open in Adobe Reader, highlight the name that is there, then press "delete". The blue box will not print. How do convert to JPEG? There are several free online PDF to JPEG converters. I prefer this one: https://pdf2jpg.net. Just upload the whole PDF file, and you can download pages as individual JPEGs. You can also send your completed PDF to me at Shop@PaperCraftValentines.com and I will convert it for you.